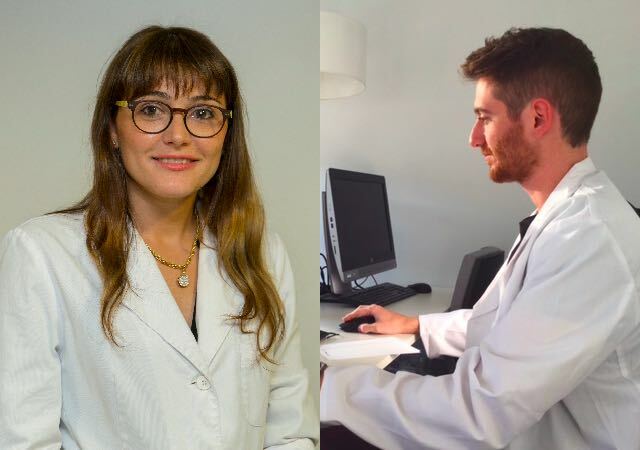 Dr Lucía Ferraro and Eduardo Rodríguez Bocanegra visited the German municipality of Leibertingen last weekend to present tools developed by the BMF and its collaborators for the development of regenerative therapies and for the diagnosis and monitoring of visual degeneration. Mr Rodríguez Bocanegra introduced an animal model of selective geographic atrophy that the BMF researcher described as a useful tool in the research of new regenerative therapies for the recovery of visual function through cell therapy or optogenetics. This study, entitled “A Swine Model of Selective Geographic Atrophy of Outer Retinal Layers Mimicking Atrophic AMD: A Phase I Escalating Dose of Subretinal Sodium Iodate”, is published in the journal Investigative Ophthalmology & Visual Science. Mr Rodríguez Bocanegra took part in a session on the disease model generation of the EYE-RISK European project. For her part, Dr Ferraro presented at the poster session her paper entitled “Validation of an adaptive optics scanning laser ophthalmoscope prototype in patients with degenerative retinal diseases”. This set out the results obtained from the LITE European project in close collaboration with the Institut de la Màcula (IM) and the Institute of Photonic Sciences (ICFO). In this project, a new piece of equipment that obtains images of photoreceptors in patients with Stargardt’s disease or Retinitis Pigmentosa was created in conjunction with Italian partners Construzione Strumenti Oftalmici (CSO), the Istituto Nazionale di Ottica (INO) and the Istituto di Fisica Applicata Nello Carrara (IFAC). Dr Ferraro spoke of its usefulness in learning about the pathogenesis and progression of these diseases in greater depth. The Young Research Vision Camp, sponsored by EYE-RISK and held this year from 29 June to 2 July at Wildenstein Castle (Germany), is an annual event that draws dozens of young scientists who present their studies and have the chance to establish possible collaborations in pan-European research projects. The three days of the congress featured a number of paper sessions that addressed topical issues in the field of ophthalmological research. These included the development of the retina, disease models, homoeostasis, hypoxia, cell death mechanisms, risk factors, new developments in visual rehabilitation and gene therapy. EYE-RISK is funded by the European Union’s Horizon 2020 Research and Innovation Programme under Grant Agreement 634479.